Using materials and shapes reminiscent of modern construction, Harald Klingelhöller’s sculptures at first appear self-sufficient. However, the pieces create a communicative network through repetition and visual similarities and thereby activate the space itself. This theme is further examined in the catalogue essay by David Moos. Produced in collaboration with Yves Gevaert, Brussels. 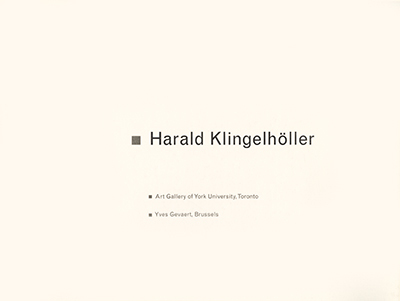 Received Honorable Mention for Design from the Ontario Association of Art Galleries, 1997.